I have a lot of books about cocktails, but this one is a basic I turn to again and again. Gary Regan (“Gaz”) talks about spirits, their background, history and uses brand names. 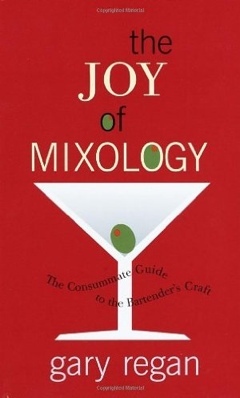 He draws a fascinating chart of cocktails by ingredient and combination — duos, trios — and tells you when an old recipe needs personal “tweaking.” If you buy only one book about booze, make it this one. Here’s a product that lives up to its name and hype, as do most products we have tried from this line: Van Gogh Dutch Caramel Vodka. We have some outstanding drink recipes using this vodka, and we’ll be posting them in the next few days. Until then, go pick up a bottle and experiment. It actually tastes like what it says it does! Newly introduced in 2009, Van Gogh Dutch Caramel Vodka captures this sinfully delicious flavor in a natural caramel color. Van Gogh Dutch Caramel Vodka is hand-crafted in small batches through a unique double infusion method, using only natural ingredients and premium grain alcohol, insuring that Van Gogh Dutch Caramel Vodka actually tastes and smells exactly as the name suggests: like luscious, pure caramel. In the realm of adult beverages and sophisticated fun, the image of the cocktail shaker has become iconic. Its shape is recognizable all over the world; it has no other purpose than the creation of joy. Baby formula and Instant Breakfast were never meant to sully its interior. This wonderful handheld mobile device requires only the power of your wrist, and when you use it you are walking in the footsteps of every great mixologist who has preceded you. 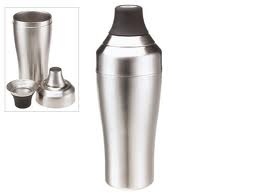 When flipping through the pages of cocktail books and snooping around on eBay, one is quickly exposed to the beauty and variety of cocktail shakers of yore. And cocktailians do love to collect them. I’ve tried using my old shakers and the problem is that many were poorly-designed or the metal or plastic in them has mutated with age. They leak; they won’t open; they won’t close. Leave them on the shelf or use them for straws or swizzle sticks. On to the new. We can and will go into a discussion of Boston versus Cobbler shakers but this ain’t it. Today I’m going to tell you about my favorite workaday shaker, the OXO Good Grips cocktail shaker. This baby sits at the front of my shelf and when I slap it down on the counter everyone knows it’s fun time. It’s a three-part shaker, cup, strainer and lid. The main part, the cup, is insulated and therefore comfortable to hold. The lid, or cap, has a nicely-designated measuring system inside it and functions as a jigger. But my favorite part is the strainer. I love the tapered nozzle as it enables accurate pouring into small cocktail glasses. The somewhat-petite size of this shaker makes it more convenient for us ladies to hold and shake but it’s also its only drawback. You can’t do a batch of Martinis in the OXO, but then, in the best of worlds, every Martini should be fresh and made to order. OXO manufactures several cocktail shakers, including a plastic one, so we’re including a photo and a link to our favorite for purchase on Amazon. Go forth boldly, armed with the best! Always drink responsibly; always drink well. We don’t like to bother with focusing on what is wrong out there but this is basic information you should have before you start trying to mix your first drink. THERE ARE NO GOOD BOTTLED LEMON OR LIME JUICES! They all at best taste like battery acid and none of them have the subtle perfume of real fresh-squeezed juice. Just compare fresh-squeezed orange juice to bottled juice. Bottled juices are DEAD; they are the decaying fluids left to rot in a bottle. The only methodology we have found for preserving fresh-squeezed juice is to bag it in smaller amounts in zip lock bags with all the air pressed out and freeze them. Use nothing more than room temperature to thaw them and you will have the closest approximation to fresh. If you go to a bar that is pushing a high-priced cocktailian menu and you see one of these plastic bottles be forewarned: you will be getting a mediocre at best drink and more likely a bitterly sour abomination that resembles it’s namesake in name alone. Try a test at home: squeeze some lime juice and compare it to one of the above and it will become obvious. Every supermarket sells lemon and lime juice in convenient little containers. They’re called “Lemons and Limes!” Nature’s little cocktail buddies. You have been informed and warned.